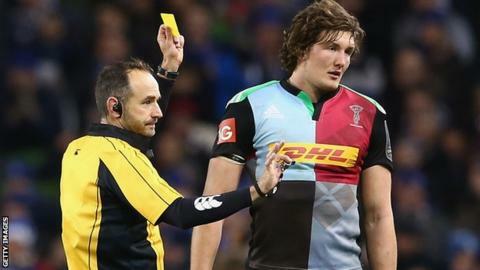 Harlequins lock Charlie Matthews has been cleared after being cited for an incident in Saturday's European Rugby Champions Cup game versus Leinster. Matthews was cited following an off-the-ball incident with Leinster's Dominic Ryan. The 23-year-old was shown a yellow card in the 78th minute for allegedly making contact with Ryan's eye area. Matthews pleaded not guilty and an independent officer was not satisfied he had committed an act of foul play. Rod McKenzie, the independent judicial officer, studied footage of the incident and heard evidence from Matthews, Quins director of rugby Conor O'Shea, and European Professional Club Rugby's disciplinary officer. Leinster's Ryan also submitted evidence, in which he stated that he had not felt any contact with his eye area. Matthews avoids a ban which, at a minimum, would have been 12 weeks.